The inquest jury ruled police failings in a control room contributed to the drowning of John Byrne, according to the Daily Mail. They heard how officers were told not to enter the water where Byrne was trapped in his van screaming for help, and instead watched on from the riverbank. A coroner investigating his death ruled that the jury could therefore not return a verdict of suicide. After almost nine hours of deliberation, the jury reached a narrative verdict and blamed Surrey Police for a series of blunders in its control room. The inquest in Woking had heard how police sergeant Danielle Mead had gone home from duty and had not personally handed over the incident to a colleague. 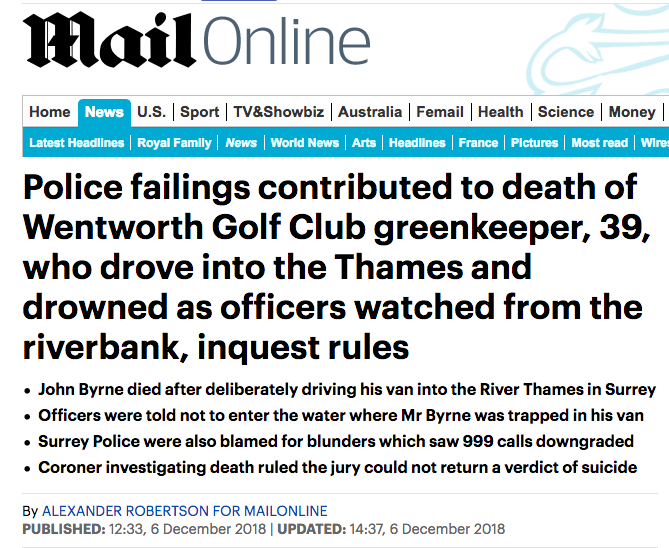 The jury also heard that the alarm over Byrne, who had previously said he was going to drown himself in the Thames at Shepperton, was downgraded from a police response of one hour to no response at all. This was due to an automatic regrading by Surrey Police’s ICAD computer system which the sergeant was unaware of. The inquest heard how Mead had gone home from duty and had not personally handed over the incident to a colleague, while Inspector Gary Cross ordered his men not to enter the water to try and save Byrne. During this time, Byrne placed planks of wood on the riverbank to use as a launch pad for driving his van into the water. Officers eventually arrived at the riverbank and watched on helplessly as Byrne screamed, shouted and cried for help to save him as his van slowly became submerged bonnet-first into the 12ft deep river. Cross issued an order that his team should not go into the water to try to save Byrne as it was too dangerous in the dark and cold. The jury did not comment in the verdict on Cross’ decision but instead issued a rider to their narrative verdict that the actions of Surrey Police during the evening of December 8, 2016 contributed to the father’s death. Coroner Darren Stewart ruled that the jury of seven men and four women could not return a finding that he had died as a result of suicide.